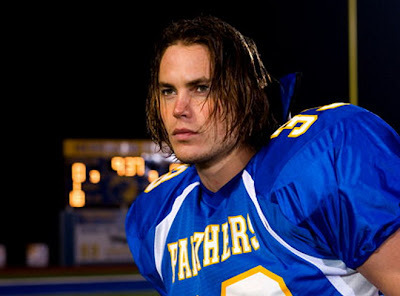 From the moment we first caught a glimpse of Taylor Kitsch as Tim Riggins with his“Texas forever!” catchphrase, we knew he was bound for Hollywood stardom. Not only is the Canadian ex-model a beautiful man, but he can act. And it seems 2012 is Kitsch’s year: With John Carter already out, May will bring the release of Battleship – a film adaptation of the Hasbro game, it finds the actor leading a cast that includes Liam Neeson, Rihanna, Brooklyn Decker, and Vampire Eric from True Blood. So even if it’s not well-reviewed, it’s bound to be a blockbuster. What’s really interesting is his third film of the year, Savages. An Oliver Stone-helmed adaptation of Don Winslow’s well-regarded novel Savages, it could establish Kitsch as worthy of acting in big movies with his shirt on.